Description: Gametophytes, cylindrical, softly gelatinous, pale pinkish or reddish-brown fronds, to 2 mm wide and 300 mm long when mature. Much branched, ultimate branchlets short, irregular, holdfast small, discoid. 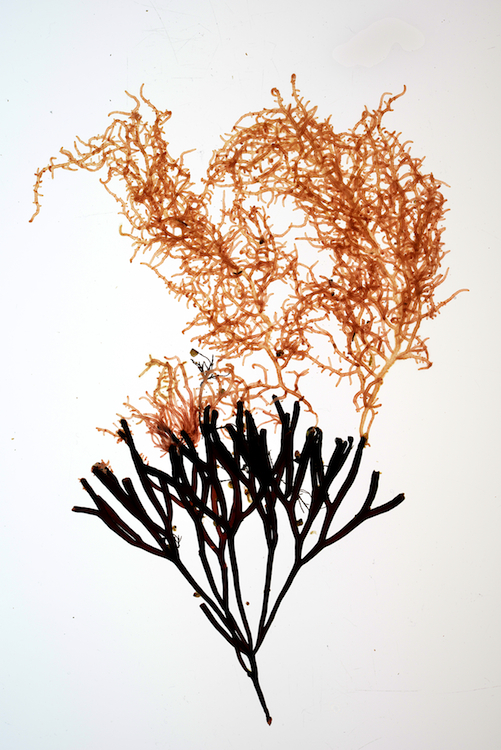 Tetrasporophytes ramifying in the fronds of Polyides rotundus as an irregularly branched endophyte. Habitat: Gametophytes are summer annuals (May or June to September or October), solely epiphytic on Polyides rotundus (below) in lower tidal pools and in the shallow subtidal, widely distributed on western and south-western coasts, sporadic but often locally abundant, particularly in large, sandy pools. 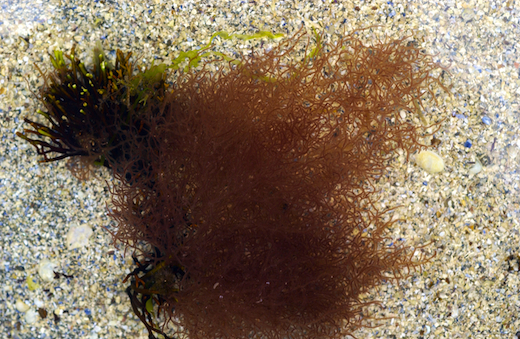 Similar species: Nemalion helminthoides is broader, deeper red in colour, and does not have as many branches; however, Nemalion does not occur in pools and generally only grows on barnacles, mussels or limpets. Key characteristics: Association with Polyides rotundus; gelatinous consistency, and profuse, almost pinnate branches. Distribution: Sweden, W and SW Britain and Ireland, apparently south to Atlantic Spain. Mediterranean records require further study, particularly since the host does not occur there. Site © M.D. Guiry 2000 - 2019. Important copyright notice: all text, design and photographs on this site are copyrighted by M.D. Guiry unless otherwise stated and all rights are strictly reserved. Click here for copyright information and contact. Website design: 249 Design Studio. Site maintained by M.D. Guiry (michael.guiry@nuigalway.ie). There have been 8736586 page loads since 1 January 2014 on 25 April 2019.